Detail from The Laboratory, 1895, oil on canvas by British artist John Maler Collier (1850–1934). Image courtesy of The Athenaeum. Yet when the story first appeared, it caused some bewilderment among reviewers, such as the critic in Blackwood’s Magazine who couldn’t imagine a perfectly normal and loving husband (and, ultimately, his wife) worrying over a beauty flaw: “If the novelist wished to describe this egregious connoisseurship in female charms, he should have put the folly into the head of some insane mortal.” What aggravated some nineteenth-century readers of Hawthorne’s stories is that his “mad scientists” weren’t, well, mad. In such stories, Hawthorne may remind today’s readers more of Edgar Allan Poe—or even H. G. Wells—than of the author of The Scarlet Letter, and the story’s horror and science fiction elements surely explain the reasons for the renewed interest in it. 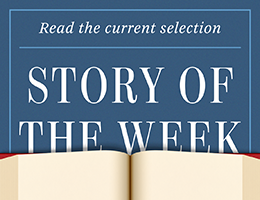 We present it as our Story of the Week selection for readers to decide for themselves.